“We live in the Republic of Feel-Good in a time when all the scum of America is rising to the top.” So begins Public Men, the final novel of “the University trilogy” in which Pulitzer Prize winner Allen Drury concludes some fifty years in the lives of the members of the World War II generation whose stories he began on the eve of the war in the novel Toward What Bright Glory? The second novel, Into What Far Harbor?, carries them on through the challenges, triumphs, and tragedies of the war and on to the years when they must worry about their world and the world of their children against the backdrop of the later Vietnam War. Now in Public Men, set in the year 2000, when most are either about to embark upon, or have already entered, their eighties, the fifteen who remain of the original twenty-six meet for a last reunion on the beautiful campus where they shared a fondly remembered fraternity house and the hopes and dreams of youth confronted by history's most chaotic and ominously foreboding century. Public Men concerns them all, but overshadowing their lives as in the two previous novels is the life of Richard Emmett Wilson—“Willie,” now and for many years a United States Senator from his native California; his legislative triumphs on Capitol Hill; the tragic death of his first wife, Donna; his second and third marriages; his political disagreements with, but ultimate pride in, his older son Latt as Latt follows in his footsteps into the House of Representatives and then into the Senate; and, finally, Willie’s campaign for president, threatened by other personal tragedies, most devastatingly those of his gentle, vulnerable younger son, Amos. Through it all, Willie, often in alliance with Tim Bates, does battle against what he sees as the “phony liberalism” of his famous fraternity brother Dr. René (Renny) Suratt; and Renny and his powerful friends of academe and the media in turn do battle with what they see as the “reactionary conservatism” of Willie and his friends. Tim, wielder of a savage commentator’s pen, refers to “Renny and his crew” as “the scum” he attacks. Renny responds with equally scathing pen and matching contempt. As with many of the public men in Public Men, these three fraternity brothers sum up what they regard as the major political and social issues of end-of-the-millennium twentieth century. 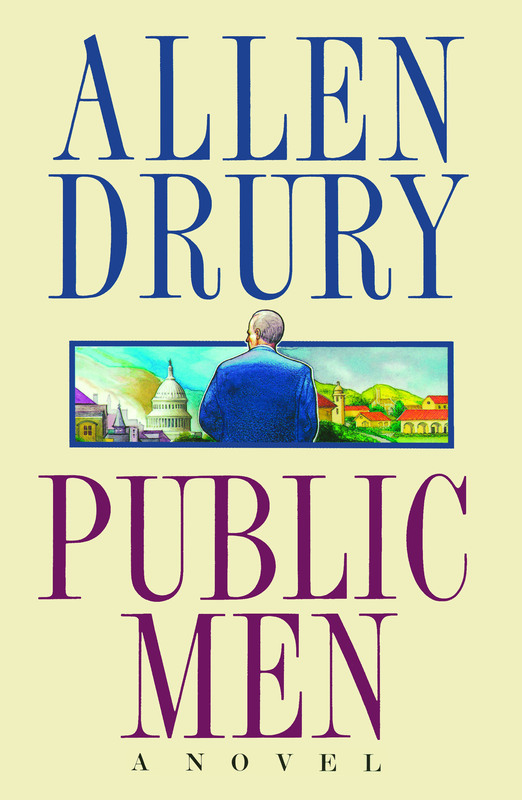 Allen Drury skillfully meshes the public and private lives of his characters against the Washington world that has formed the rich backdrop of many of his twenty-five books. The late Allen Drury was for twenty years a Washington correspondent covering principally the Senate, with occasional assignments to the House, the White House, Pentagon, Supreme Court, and United Nations for the UPI, The Washington Star, and The New York Times. His first novel, Advise and Consent, won the Pulitzer Prize for fiction.